House "Il Gelsomino" is located on a hill in the countryside with a splendid views over the hills a few kilometers from San Gimignano. Cottage in a rustic style with exposed beams and cotto. It consists of a bright living-dining room with garden access and fully equipped kitchenette (4 burner stove, refrigerator, microwave, etc.). Large double bedroom, shower room / wc and mezzanine with the second bedroom with twin beds or double. Large furnished private garden with table, chairs and deck chairs. Park and panoramic swimming pool for the exclusive use of guests of the village. We are in the heart of Tuscany a few km. from San Gimignano and Gambassi Terme where it passes the famous Via Francigena, a place of pilgrimage in search of spectacular and unspoiled landscapes can visit the Franciscan convent of San Vivaldo with its chapels is called "Little Jerusalem". In less than an hour you reach the art cities of Florence, Siena, Pisa, Lucca, Pistoia, Arezzo. The Medieval village of Certaldo, Boccaccio's birthplace where he lived and died at his home in Via Boccaccio, is 12 km away. of distance. In this village, in summer, they are numerous cultural and artistic events, and in the second of July the spectacular festival "Mercantia" with companies of street artists and craftsmen from all parts of the world enliven every corner of the village. The magnificent city of Volterra and the Chianti road are located about 20 km. You can visit the famous towns of Pienza, Montepulciano and Montalcino and again Greve in Chianti, Castellina in Chianti and Radda in Chianti, where you can taste the local specialties of real Tuscan cuisine. 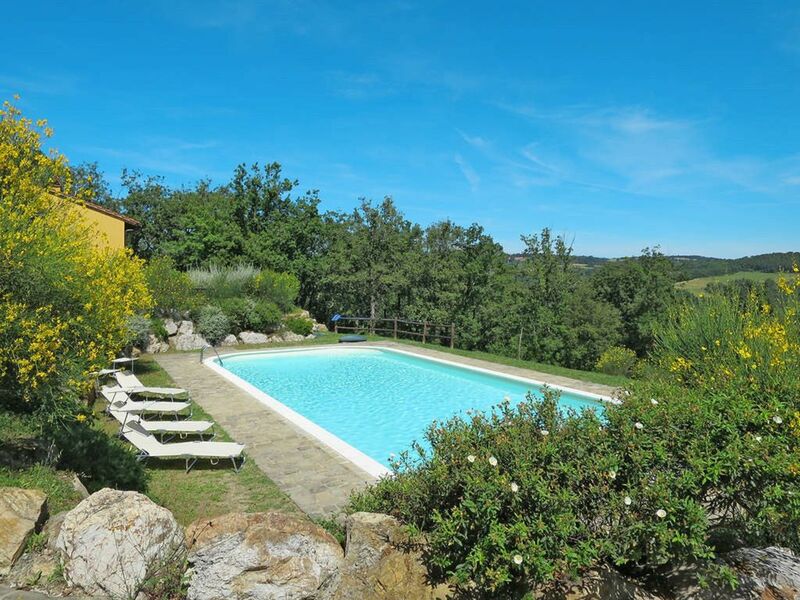 Nearby is the golf course of Castelfalfi with 18 holes located in a unique landscape and a riding stable. Distances: San Gimignano km. 8 km Certaldo. 10, Siena km. 30, Florence Km. 40, Volterra km. 20, Pisa and Lucca km. 60, Chianti Road km. 20 - Golf Castelfalfi km. 10. Car parking inside the fenced village. Die Unterkunft bietet alles, was man für einen schönen Urlaub braucht. Der Pool ist großartig, die Landschaft hinreißend, die Wohnung sehr hübsch, bescheiden aber zum Wohlfühlen. Dès notre arrivé Miriam et Carlo ont montré ce que accueil signifiait, toujours avec le sourire ils nous ont présenté ce qui allait devenir notre ‘chez nous’ et conseillé sur les différents circuits touristiques possibles. Sur place de nombreux restaurants nous ont donné l’occasion de découvrir la cuisine italienne sous toutes ces formes de la plus simple à la gastro. Enfin pour ce qui est des visites touristiques, en plus de toutes nos sorties dans la campagne Toscane pour rejoindre les différents monuments nous avons testé Florence par le train, au départ de Certaldo c’est 50 mn avec une arrivée dans le centre et des retours réguliers, que du bonheur ! Encore merci à Miriam et Carlo pour cette gentillesse, nous pensons que d'autres semaines serons nécessaires pour compléter notre culture, pour les personnes qui souhaitent du dépaysement et de la sérénité vous serez les biens venus. Alors Arrivederci ! nearest Certaldo, San Gimignano and Volterra and the Valdelsa area and the countless small towns all to discover. Certaldo km. 4 - Pisa- Lucca km. 65.
sport activities: riding, swimming pool, tennis, trekking.